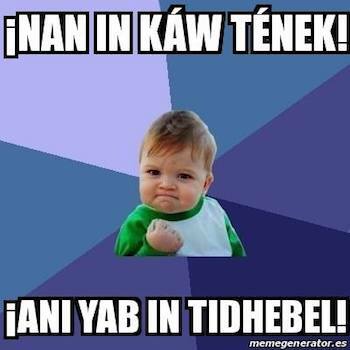 Join the Mother Language Meme Challenge by creating a humorous or reflective internet meme in your native tongue. Starting today and running through February 21st, we invite you to take part in this fun online campaign to commemorate International Mother Language Day. Meme in the Tének language from México. Created by Luís Flores. To take part, just follow the simple steps outlined on the Challenge’s website (http://memeML.org), which includes finding an image, adding text and hashtags, including #MemeML, and sharing on your favorite social media platform. You will also find links to some free, web-based platforms to create and save your creations. In the month prior to International Mother Language Day 2017, we’ll be sharing, retweeting, and liking contributions from around the world and featuring some of our favorites here on Rising Voices. If you are an organization, collective, project, or other group currently working on language revitalization around the world, we are looking for new partners to join us to promote this Challenge. We are also looking for others to help translate the site into more languages so that we can reach speakers of more languages. Please contact us for more information.